The relevance of corruption to corporate governance is clear. A well-governed organisation will not allow corruption either in external transactions or internally. Yet in many companies and indeed regions around the world bad governance and corruption is still endemic. 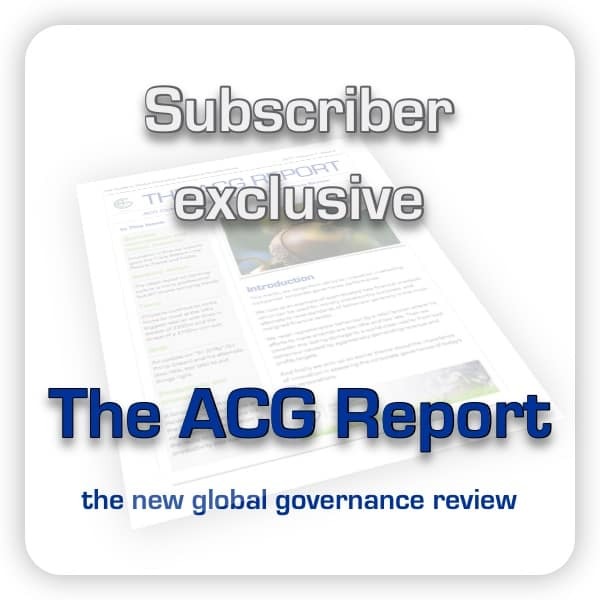 In our quest to improve standards of corporate governance, we review global progress in fighting corruption. Corruption might be said to be, like the poor, always with us. 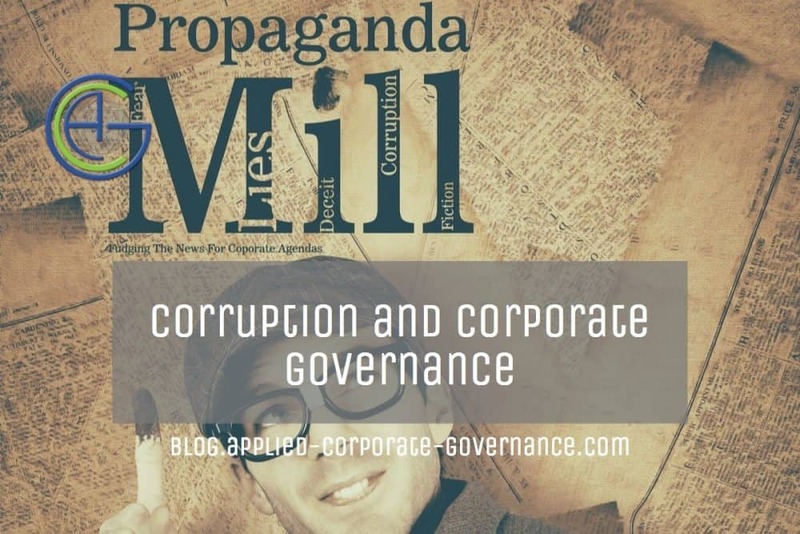 A properly governed company with a strong ethical basis will steer clear of corruption, both in its external transactions and in its internal organisation and processes. Still, there are many companies round the world which have some way to go before reaching a high standard of governance and there are many regions and countries in which corruption is endemic. So a brief review of global progress in tackling corruption would seem appropriate in our mission to improve standards of corporate governance. A recent survey of corruption was undertaken by Control Risks Group Holdings Limited, a global risk consultancy specialising in political, security and integrity risk. The exercise was titled ‘The Corruption Survey 2015/16’ and questioned 824 companies worldwide about business attitudes to corruption. A headline conclusion was that 41% of those surveyed said they had pulled out of deals primarily because of the fear of corruption. A crumb of comfort was that in the US, Germany and the UK, improvement was suggested by figures showing that companies with strong enforcement controls lost less business than before, illustrated by figures showing that in 2006 44% of companies lost business to corrupt competitors, but that figure was down to 24% in 2014. And 81% of respondents supported the introduction of international anti-corruption laws on the basis that they “improve the business environment for everyone”. It was felt that these laws made it easier for good companies to operate in high risk markets and acted as a deterrent to corrupt competitors, particularly in developing countries. However, there were still wide variations in the degree to which company anti-corruption programmes were implemented and the survey suggested that companies needed to address the issue of incentives to blow the whistle on corruption. It seems that fear of consequences ranked well above recognition of company ethics to individuals contemplating corrupt behaviour. Similarly, financial targets were much more important than anti-corruption targets. Furthermore, companies were all too often assuming that the mere existence of compliance processes was preventing wrong-doing, and hence were not uncovering the reality by independently checking for corrupt activities. Most countries have laws governing corruption and bribery, but it seems that the two most important laws affecting world trade in regard to corruption are the US Foreign Corrupt Practices Act and the UK Bribery Act. The Foreign Corrupt Practices Act of 1977, as amended, was enacted for the purpose of making it unlawful for certain classes of persons and entities to make payments to foreign government officials to assist in obtaining or retaining business. Specifically, the anti-bribery provisions of the FCPA prohibit the willful use of the mails or any means of instrumentality of interstate commerce corruptly in furtherance of any offer, payment, promise to pay, or authorization of the payment of money or anything of value to any person, while knowing that all or a portion of such money or thing of value will be offered, given or promised, directly or indirectly, to a foreign official to influence the foreign official in his or her official capacity, induce the foreign official to do or omit to do an act in violation of his or her lawful duty, or to secure any improper advantage in order to assist in obtaining or retaining business for or with, or directing business to, any person. Is there a set of appropriate procedures in place? Is there top level commitment? Is due diligence built into processes? How effective are communication and training? What procedures are in place for monitoring and reviewing? An anti-bribery Directive of 2014 requires companies to disclose, amongst other matters, information on their anti-corruption efforts. It applies to larger companies with more than 500 employees, and by 2016 EU member states are expected to incorporate these provisions into their national laws. If a company has not adopted a programme relating to any of the subjects listed in the directive, it will be required to explain why. The OECD Anti-Bribery Convention of 1999, updated in 2007, has been ratified by Argentina, Brazil, Chile, Colombia, and Mexico, with Peru as an observer. The signatories to the Organisation of American States Inter-American Convention against Corruption 1996 comprising all the states of North, Central and South America and the Caribbean, will have incorporated the necessary amendments to their legislation and criminal codes to reflect their commitment to its aims. However, the test is the degree to which the good intentions are reflected in day to day practice. The Petrobras affair in Brazil points to the gap between theory and practice here. Two reforms introduced recently and regarded as important are Brazil’s 2014 Clean Companies Act and Mexico’s 2015 National Anti-Corruption Commission. This Regional Anti-Corruption Programme for Africa is an initiative of the UNECA, Addis Ababa, Ethiopia, being undertaken in collaboration with the African Union Advisory Board on Corruption aimed at up scaling the fight against corruption on the continent with a view to ensuring a corruption free, better governed and economically prosperous continent. The United Nations Convention against Corruption (UNCAC) (2003) and the African Union Convention on Preventing and Combating Corruption (AUCPCC) (2003) constitute the main policy and political frameworks for the formulation of this programme, and its main objective is to facilitate the elaboration and implementation of these two frameworks on the African continent. Individual countries have their own programmes and some have bigger problems than others. For instance, Transparency International lists Somalia as the most corrupt country in the world according to its perceptions survey. Overall, it’s difficult to see an overarching programme and maybe this is something that can only be tackled on the ground, country by country. The Transparency International Corruption Perception Index 2015. Click on a country to see its score. The map can be moved by clicking and dragging with the mouse (or finger on mobile devices). The Clifford Chance Review of 2014 appraises all the major countries of the Asia Pacific region and makes the point that countries vary in their legislation and enforcement practices. Criminal enforcement standards differ, as do levels of civil liability, which makes it important that companies should design their anti-corruption procedures carefully with local requirements in mind. Accidentally breaking a local law will bring its own penalties, but worse, may draw the attention of other international enforcement bodies. The report stresses that corruption is obviously illegal everywhere and all the countries it covers have signed the UN Convention against Corruption, but the definition of corruption varies and it cites examples. For instance the Peoples Republic of China and Malaysia criminalise private sector bribery but Japan and Indonesia don’t. And bribing a foreign public official is a criminal offence in Taiwan but not in the Philippines. Having looked briefly at the anti-corruption initiatives around the globe, let’s now examine the evidence on the ground to judge progress. The Obama administration has taken steps to enforce the Foreign and Corrupt Practices Act in cases around the world. The website of the Dept of Justice lists all the actions taken over the years since 1977 against companies both domestic and foreign. And that is all separate from the US banks’ colossal domestic sub-prime lending to so-called NINJAs (no job, no income, no assets) which led to the financial crash of 2008. In 2014 the European Commission reported to the Council of Ministers and the European Parliament the results of an investigation into corruption in the EU. EU Member States have in place most of the necessary legal instruments and institutions to prevent and fight corruption. However, the results they deliver are not satisfactory across the EU. Anti-corruption rules are not always vigorously enforced, systemic problems are not tackled effectively enough, and the relevant institutions do not always have sufficient capacity to enforce the rules. Declared intentions are still too distant from concrete results, and genuine political will to eradicate corruption often appears to be missing. Its Special Eurobarometer gathered data, firstly on general perceptions of the prevalence of corruption and secondly on personal experience in bribery. The results varied greatly from country to country with less corruption actually being experienced in northern Europe but in all regions a much higher perception of corruption than incidents actually reported. At the European level, more than 4 out of 10 companies considered corruption to be a problem for doing business, and patronage and nepotism were a similar problem. 50% of the construction sector and 33% of the telecoms/IT companies felt corruption was a serious problem for doing business. The smaller the company, the more often corruption and nepotism appeared as a problem and the country analyses showed that public procurement was particularly prone to corruption in the Member States. Preventive policies reviewed in the study covered a wide variety of aspects including clear-cut ethical rules, awareness-raising measures, building a culture of integrity within various organisations, and setting a firm tone from the top in relation to integrity issues. Beyond this were effective internal control mechanisms, transparency, easy access to public interest information, effective systems for evaluation of performance of public institutions, etc.. However, there was a considerable divide among the different Member States concerning how they approached prevention of corruption. For some, effective prevention had contributed to a long-standing reputation of ‘clean countries’ with active and dynamic integrity and prevention programmes in place which were prioritised by most central and local authorities. For other Member States, corruption had been seen as a lesser problem for a long time, hence no active stance on promoting comprehensive preventive actions was taken. The outflow of illicit cash from Latin America has been described by Frank Vogl, a co-founder of Transparency International, as a staggering tax on its citizens. And there is growing awareness of the scale, and resentment on the part of increasingly well-informed citizens at the economic cost to the economies concerned. At some stage in recent years, the leader of nearly every country seems to have been involved in some kind of financial scandal. To give an idea of the impact, estimates by the Institute of International Finance, suggest that real economic growth in the region was an estimated 0.4% for 2014, reducing to 0.2% in 2015. Meanwhile, according to Global Financial Integrity, illicit financial flows out of Latin America are running at around an annual 3% of GDP. The real figure is probably higher since the calculations rely on published statistics and cannot capture the illegal data. In terms of sheer scale, the corruption scandal around Brazil’s Petrobras is the largest in the country’s history. Pressures are mounting on banks from public prosecutors and bank regulatory authorities regarding secrecy and in January 2013, HSBC, one of the world’s largest banks, agreed to pay a $1.92 billion fine to U.S. authorities for allegedly laundering Mexican drug cartel money into the United States. “Some 34 percent of respondents from Africa reported losing out on deals to corrupt competitors. Corruption risks continue to deter investors. 30 percent say they have decided not to conduct business in specific countries because of the perceived risk of corruption”. Nigeria has been losing large sums from its oil revenues over the years and the former central bank governor Lamido Sanusi was sacked by then-President Goodluck Jonathan after suggesting that $20 billion in oil revenues had not been paid over to government by the state oil firm. It quoted a Corruption Watch report in 2013 that referred to mismanagement of public funds and abuse of resources by officials at local government levels and declared local government to be the most corrupt institution in the country. A PwC survey quoted by the Financial Times in 2012 suggested that Middle East business leaders were almost twice as likely as their global peers to say that they expected to face bribery and corruption (39% of their local interviewees compared with a global average of 23%). Depressingly, the study found that the most common means of detection in the region was “by accident”. As Middle East economies have developed and become increasingly sophisticated, so too have the methods of committing fraud in the region. Despite high profile efforts by governments to combat fraud, bribery and corruption, they remain common in the Middle East. Management boards of organizations vary widely in their approaches to stamping out fraud. Some companies appear willing to tolerate fraud. Bribes, particularly in the form of kickbacks, are still regarded as an accepted part of doing business in the Middle East, often with little thought for potential to corporate reputation damage. When fraud is detected, companies in the Middle East often prefer to deal with it internally, for fear of losing face. Dubai launched an anti-corruption drive in 2008, particularly looking at the property and finance sectors, and the change of regime in Egypt resulted in corruption investigations into deals carried out during former president Hosni Mubarak’s rule. A 2010 survey by Hong Kong based consultancy PERC (Political and Economic Risk Consultancy) named Indonesia as the country voted most corrupt in Asia Pacific. Following up were Cambodia and Vietnam, followed by the Philippines, Thailand, India and China. The least corrupt countries were Singapore, Australia and Hong Kong. According to Transparency International’s global corruption index, 43% of the people surveyed in Indonesia thought corruption had increased between 2007 and 2010. As in other parts of the world, the economic downturn following the 2008 crash made lots of people much worse off and made them all the more conscious of the corruption around them and the adverse effect it was having on their countries’ economies. In China, corruption is perceived to cast a negative shadow over business dealings, though after President Xi Jinping assumed office, he launched an extensive anti-corruption purge which has resulted in thousands of arrests. At an early stage, the railway minister was fired over allegations he received huge bribes when handing out contracts for the country’s new high-speed rail network. It was reported that he allegedly embezzled more than 800m yuan ($121m). Jan Toporowski, chair of the department of economics at the School of Oriental and African Studies says that “It’s typically the government priority investment sectors that tend to be associated with corruption….What we saw with railways in China is that the government has attached huge importance to infrastructure development. They are willing to pay for rapid infrastructure development. In that situation anyone who can promise that speed gets the money”. In India, the telecommunications industry is under investigation, after reports that second-generation (2G) spectrum licences were awarded to major companies for a cheaper price. Analysts estimate about $40bn was lost in revenue for the Indian government. And in Malaysia the prime minister is under attack regarding a payment of $680m which is said to have been paid into his bank account by the Saudi royal family. The Asian Development Bank says that corruption, and weak governance in general, undermines government revenues, results in poor infrastructure and hinders the pace of poverty reduction in Asia. What guidelines exist in tables of performance? Each year we score countries on how corrupt their public sectors are seen to be. Our Corruption Perceptions Index sends a powerful message and governments have been forced to take notice and act. A lesson Transparency International draws from its research is that some of the top-scoring countries in terms of “clean” public sectors are sometimes caught condoning corruption in the foreign countries in which they have business interests. It quotes the example of Sweden, number three in the index. A firm 37% owned by the Swedish state is accused of paying millions of dollars to bribe officials in Uzbekistan, which comes 153rd in the index. What lessons do we at Applied Corporate Governance draw? firstly, as the EU Commissioners say, an active approach to prevention, setting the tone from the top, is the way to head off corruption and ensure good corporate governance. finally, compliance isn’t enough; companies are warned by these surveys that they must not rely on having compliance routines in place, but must check the reality on the ground. We would say this is exactly what our Survey approach is all about and why we have always advocated including an ethical review as a key part of these regular surveys.